Star Wars has always been about family. Whether it be Luke Skywalker’s realisation that he fancies his sister, or finding out his dad is space Hitler, the themes of bonding with lost relatives and the redemption of estranged loved ones is always at its heart. This is true of the original trilogy, it is true of the new trilogy, and it is even true of the prequels, with Anakin’s slide to the Dark Side ignited by his love for the mother of his children – and, presumably, his hate for sand. Related: the best FPS games. 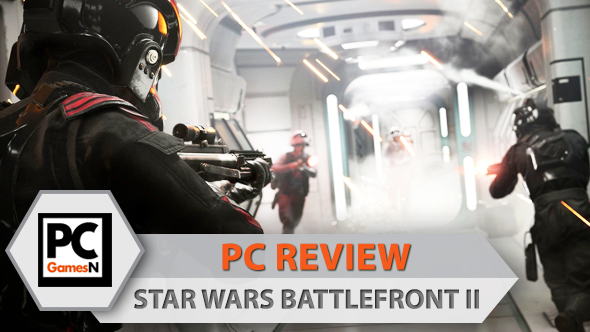 Much like Star Wars Battlefront, Star Wars Battlefront II nails the sights and sounds of the space epic films, creating an authentic audiovisual assault for fans of whirring lightsabers and the stomp of towering AT-ATs. That obsession with detail extends to the story of its all-new campaign mode, in which you play as Iden Versio, a special forces operative who works for the Empire. Her father also happens to be her commanding officer, heading up the Empire’s rebuilding efforts after the destruction of the Death Star. It hits all the familiar beats of a Star Wars movie – a planet-hopping, spacefaring tale of family and atonement told from multiple perspectives. The story exists to fill in the gaps between the original Star Wars trilogy and the events of The Force Awakens. If you wondered what Luke Skywalker got up to in that hazy interim – before he became a hermit on the Shetland Isles – Battlefront II has you covered: turns out he was fighting oversized cockroaches in a damp cave. It is fanservice at its most disappointing. And while in the chaos of multiplayer the jankiness of Jedi controls are not as noticeable, when you find yourself cast as Skywalker during a campaign mission – wildly swinging at waves of bugs, floating across a cavern, and flailing about on uneven ground – they stand out. These moments should be highlights, but the game doesn’t feel built to support them. The sections where you play as Iden Versio and her Inferno Squad, however, are excellent. One of the biggest complaints levelled at DICE’s take on Star Wars Battlefront is the absence of ground-to-space battles in multiplayer. The two different disciplines still barely interact online, but the single-player does a great job of making you feel like this is a fight fought on two fronts, with some missions even asking you to take part in a dogfight before barreling into a ship, firing at troops in the hangar, then stepping out to clean up on foot. Unlike in multiplayer, there are even animations for getting in and out of the vehicles. The game really shines when you are running through pristine corridors and nailing Rebels with precision headshots. The firearms feel great to shoot, thanks to the incredible audio work at DICE. Shots feel deadly – despite it being a family-friendly, bloodless take on war – and battles are busy, hectic affairs. Yet again, the epic scale of Star Wars’ best moments are captured perfectly. Unfortunately, the game is riddled with those not-so-heroic hero missions and, ultimately, it all fizzles out. After an exciting penultimate mission, the game ends with another dose of unsatisfying fan service, does not tie up its loose ends, and tells you with an on-screen message that Iden’s story will carry on in multiplayer. When you do head to multiplayer you will find she is locked behind in-game currency – your prize for completing the campaign is enough to buy her, but by this point I had already begun splurging on progression-essential loot boxes. Have you felt its presence, that disturbance in the Force? Actually, ‘presents’ would be more appropriate. Yes, I’m talking about loot boxes. Multiplayer is marred by an overly complex upgrade system, in which you have to earn in-game credits to spend on popping those aforementioned digital prizes open. 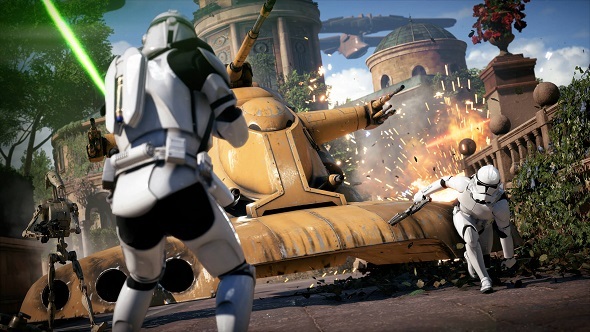 These loot boxes return Star Cards, which can be emotes, victory poses, or even stat-changing buffs and abilities for different classes. You can also create Star Cards with crafting components. Essentially, you can purchase a bunch of loot crates to craft higher power cards that can be used as soon as you reach the required level, getting ahead of the competition. Elsewhere, weapons are unlocked by simply playing as a certain class for a length of time, though some may be found in crates as well. Meanwhile, heroes must be unlocked with currency. I was earning between 200-300 credits per match, and the most expensive locked heroes – Luke Skywalker and Darth Vader, naturally – cost 15,000 credits at the time of writing (reduced from 60,000 just two hours before this review was published in response to fan feedback). It is certainly an improvement on the initial number, but still means that it would take a hefty 60 or so matches to unlock just one of them – and that is only if you do not buy any loot boxes in-between, thus sacrificing the bulk of your progression. It is a broken system that seems geared towards making you spend real money to skip, more so than any premium game I have played before. To make matters worse, you are not guaranteed to play as these heroes for a decent portion of time, making the investment seem pointless. During any single match, you have to accrue enough battle points to play as a hero, villain, or vehicle. Most matches do not even last long enough for you to save up enough to select one of the more expensive choices, and you can only play as them if nobody else already is. Chances are, when you finally take control of one of them, you will die quickly. It is a frustrating setup, to say the least. 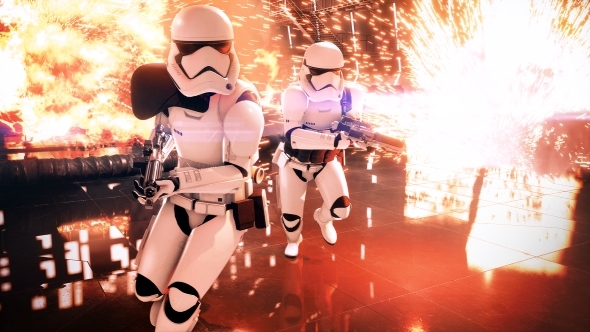 It is a great shame because Battlefront II looks and feels great to play most of the time – particularly in its 40-player, objective-based Galactic Assault matches. It is easily the prettiest multiplayer shooter I have played, looking sharper than the prequel trilogy’s CGI. Maps are gorgeous, varied, and busy with detail – there are civilians running around, robots performing maintenance, wildlife pottering about, and debris floating lazily in the breeze. It does make for a lot of visual noise, however, making it necessary for the enemies to be highlighted with ugly UI elements when you aim your crosshairs at them. The illusion also breaks apart when you realise it is all set-dressing and cannot be interacted with. In one match I even managed to hide inside the body of some alien wooly mammoth to flank the enemy team, like some glitchy Luke Skywalker freezing to death on Hoth – the models aren’t physically rendered. Saying that, the tech really is outstanding. How it looks this good and runs this well is anyone’s guess. Multiplayer is at its best when you and your team are defending an objective. Keeping an eye on the entry points, firing off scanner darts to spot an approaching squad, then blasting the entrance with an acid grenade never gets old. Most of these defensive points take place indoors, however, which means you have another issue where the aerial battles and the ground conflicts barely interact. It almost feels like two separate games mushed together – a problem the original games solved by making their fights multi-tiered. Bar the occasional death from a bomber, you will not feel threatened or interested in what is happening in the skies right above your head. Most of the ground vehicles are not a massive threat, either. As there is no anti-vehicle class, as such, vehicles can be destroyed with your blasters. Concentrated fire from multiple enemies will break your ride apart faster than Anakin Skywalker can slaughter a room full of younglings. The classes also lack definition beyond the sniper, regular assault, heavy gunner, and the support guy. This loose system creates another issue where squads feel pointless. Before you spawn, you are automatically lumped into a squad with some random players before you all go running, flying, and rocket jumping off in different directions. You are told you can earn more points for playing in a squad, but you are not automatically put with friends, even if you are playing together. The squad system doesn’t promote teamwork either as barely any abilities interact. For a game that is filled with so many players – and, to hammer home my earlier observation, a game that is ostensibly about family – multiplayer is a disappointingly lonely experience. 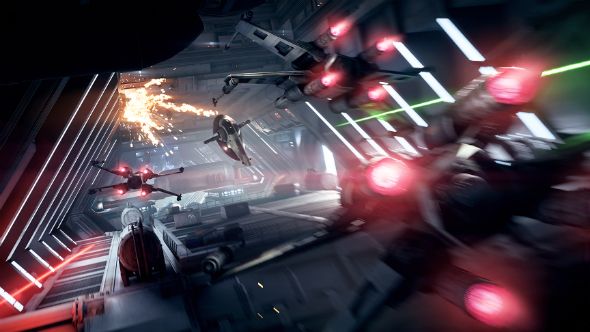 Star Wars Battlefront II houses a decent single-player campaign and good multiplayer, but, like the otherwise slick design of its multiplayer maps, that accomplishment is often obscured by distractions. Normally, my brain blocks out in-game monetisation, letting me enjoy the game for what it is. Battlefront II changes that because spenders get a real advantage here. You cannot help but notice it encroaching on everything, plastered all over the game’s convoluted, drawn-out progression system. In my first hour of multiplayer, I spent more time opening loot boxes and flipping through menus than I did playing matches. It is at the forefront of the experience, and your first few hits are free, slyly luring you in with a steady rhythm of new unlocks. One thing is for sure, the days of getting a $60 game and being able to play it without being nudged to spend more feels like a long time ago, in a galaxy far, far away.